The International Carbon Dioxide Conference (ICDC) is the single largest conference organized by the global research community every four years to present the latest scientific findings on the science of the carbon cycle and its perturbation by human activities. The ICDC10 in 2017 is the 10th anniversary conference. It covers fundamental science advancement and discovery, the generation of policy relevant information, and observational and modeling approaches. ICDC10 brings together scientists from different disciplines to work towards an integrated view on the global cycle of carbon in the Earth system. GGMT-2017 is a key conference on measurement techniques for accurate observation of long- lived greenhouse and related gases, their isotopic composition in the atmosphere relevant for climate change, and global warming research findings. The biannual meeting, known as the WMO/IAEA Meeting of Experts on Carbon Dioxide, Other Greenhouse Gases and Related Tracer Measurement Techniques, is to be held for the 19th time in 2017. The special issue is open for papers that emerged from ICDC10 and GGMT -2017 conference contributions. 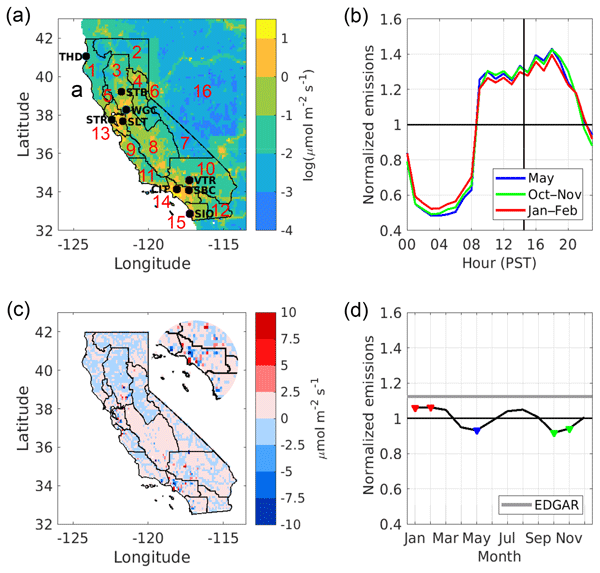 We investigate potential errors and uncertainties related to the spatial and temporal prior representation of emissions and modelled atmospheric transport for the inversion of California's fossil fuel CO2 emissions. 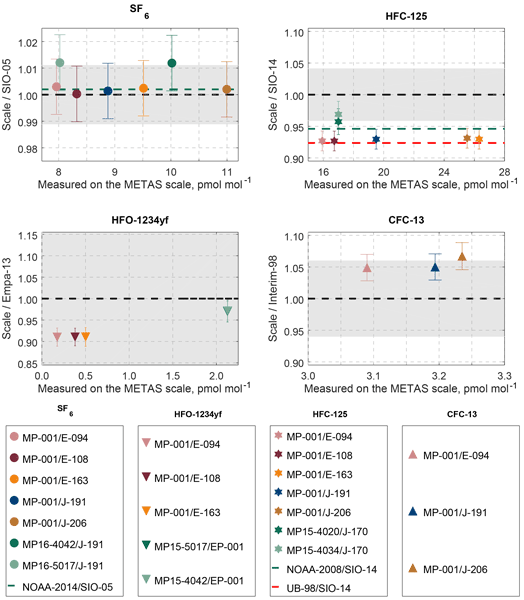 Our results indicate that uncertainties in posterior total state fossil fuel CO2 estimates arising from the choice of prior emissions or atmospheric transport model are on the order of 15 &percnt; or less for the ground-based network in California we consider. Deforestation, shifting cultivation and wood harvesting cause large carbon emissions, altering climate. 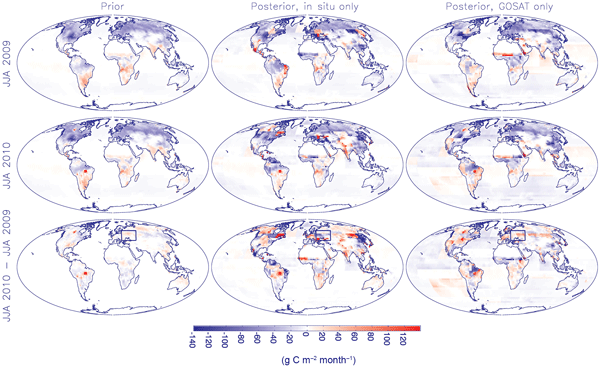 We apply a dynamic global vegetation model in a probabilistic framework. Diverse observations are assimilated to establish an optimally performing model and a large ensemble of model versions. Land-use carbon emissions are reported for individual countries, regions and the world. We find that parameter-related uncertainties are on the same order of magnitude as process-related effects. 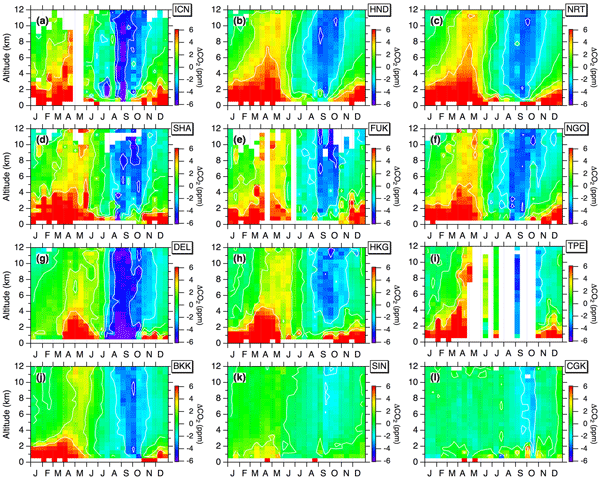 Here we analyze seasonal cycle of CO2 biases in 10 CMIP5 models in the SO. 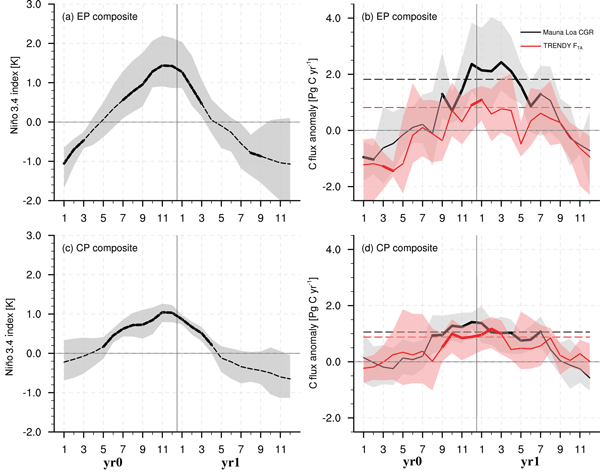 We find two main model biases; exaggeration of primary production such that biologically driven DIC changes mainly regulates FCO2 variability, and an overestimation of the role of solubility, such that changes in temperature dominantly drive FCO2 seasonal changes to an extent of opposing biological CO2 uptake in spring. 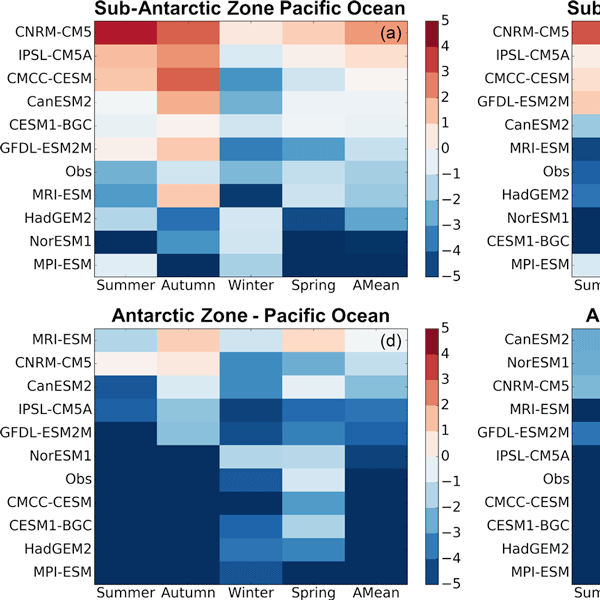 CMIP5 models show greater zonal homogeneity in the seasonal cycle of FCO2 than observational products. Land carbon fluxes are controlled in part by the responses of terrestrial ecosystems to atmospheric conditions near the Earth's surface. 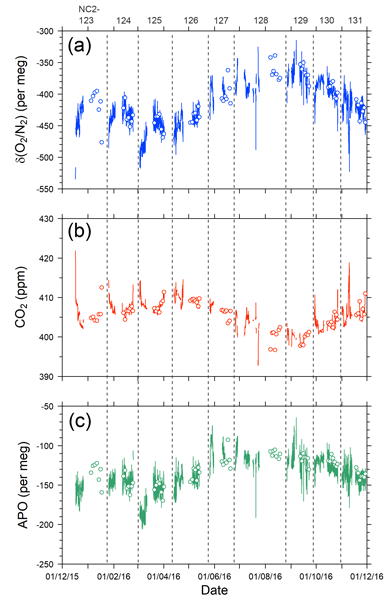 This study offers a comprehensive evaluation of the consequences of multiple facets of spatiotemporal variability in atmospheric CO2 for carbon cycle dynamics. 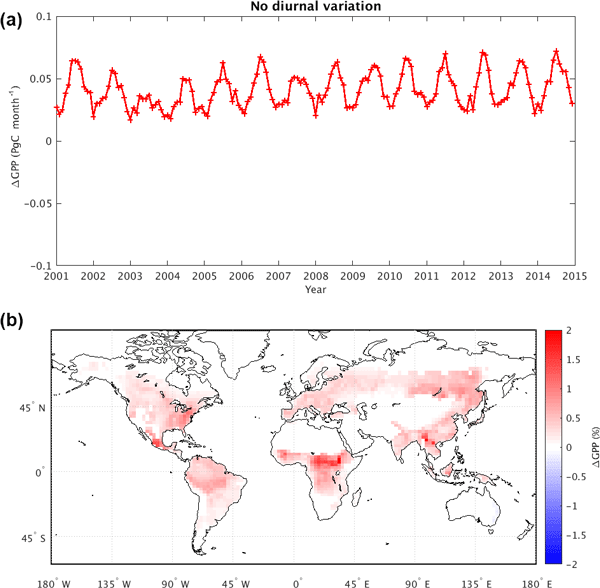 Globally, consideration of the diurnal CO2 variability reduces the gross primary production and net land carbon uptake. The relative contributions of other variability vary regionally and seasonally. Precipitation and N deposition significantly increased Rs, but warming decreased Rs, which depended mainly on the variation of soil moisture. 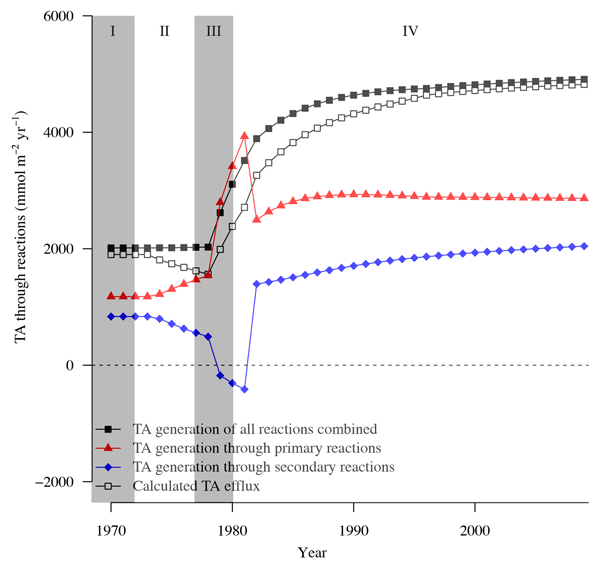 The interactive response of Rs to combinations of the factors was much less than that of any single factor, and the interactions of multiple factors largely reduced between-year variation of Rs more than any single factor, suggesting that the carbon cycle in temperate deserts could be profoundly influenced by positive carbon–climate feedbacks. Analyzers measuring methane and methane isotopic ratio were deployed at four towers in the Marcellus Shale natural gas extraction region of Pennsylvania. The methane isotopic ratio is helpful for differentiating emissions from natural gas activities from other sources (e.g., landfills). We describe the analyzer calibration. 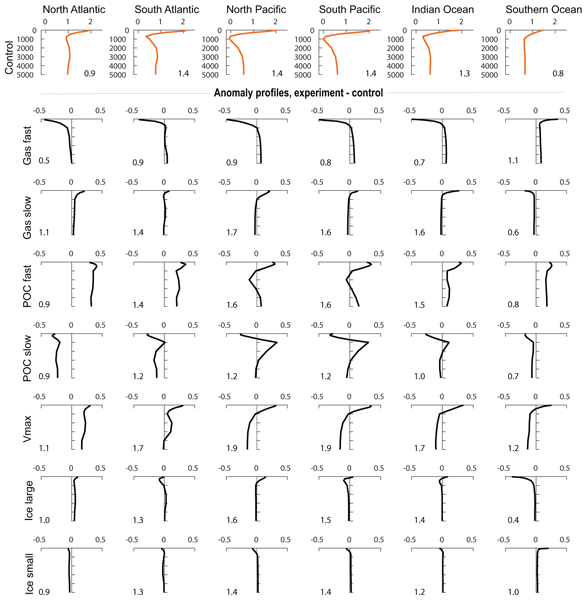 The signals observed in the study region were generally small, but the instrumental performance demonstrated here could be used in regions with stronger enhancements. 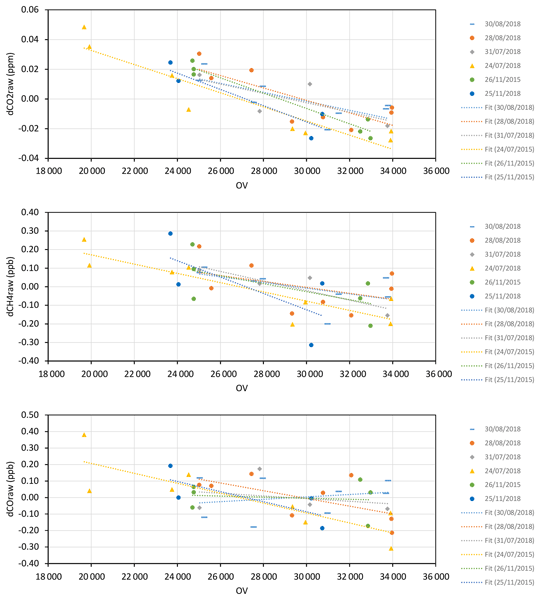 We present new primary calibration scales for five halogenated greenhouse gases. The preparation method, newly applied to halocarbons, is dynamic and gravimetric and allows the generation of reference gas mixtures at near-ambient levels (pmol mol−1). Each prepared molar fraction is traceable to the realisation of SI units (International System of Units) and is assigned an uncertainty estimate following international guidelines. 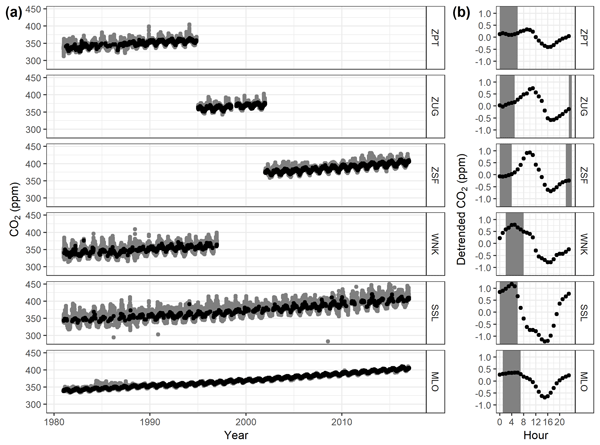 A new diagnostic reveals how fluxes constrained by two different CO2 observing systems inform atmospheric CO2 simulations. 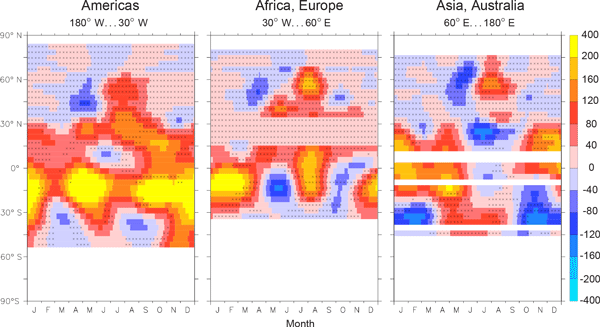 The potential for GOSAT data to better resolve zonally asymmetric structures in the tropics year-round and in the northern extratropics in most seasons is shown. Using in situ data yields a better match to independent observations on the global, annual scale. 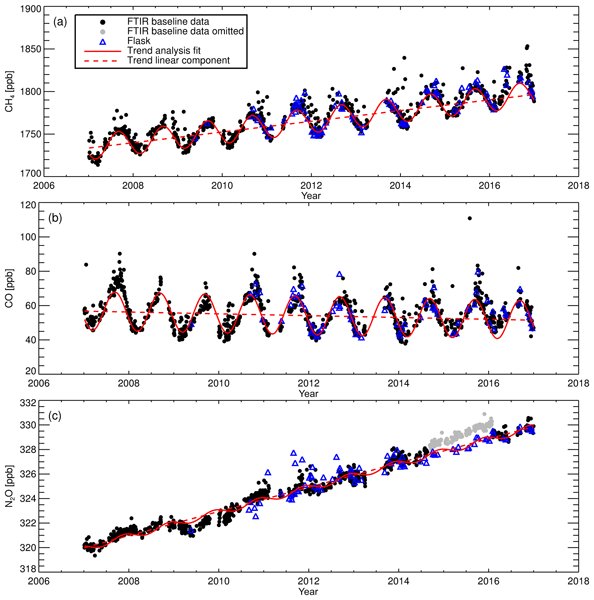 Such complementarity of the observing systems can be exploited in greenhouse gas data assimilation systems. 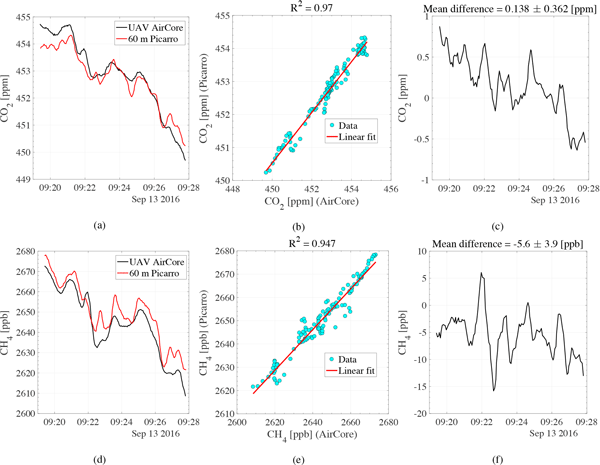 We used measurements of CO2 in the atmosphere from the GOSAT satellite and from surface sites around the world, together with a transport model and a unique estimation technique, to quantify CO2 sources and removals over a recent period. We find that climate variations can strongly influence uptake by vegetation and release in decay and fires. However, regional gaps in observations and inaccuracies to which current satellite technology is susceptible result in important estimation biases. Accurate independent verification methodology to estimate methane (powerful greenhouse gas) emissions is essential for effective implementation of policies that are aimed at reducing the impacts of climate change. In this paper, four uncertainties that complicate independent estimation of urban methane emissions are identified. They are definition of urban domain, heterogeneity in background, temporal variability, and prior source knowledge. Ways to improve the emission estimates are suggested. 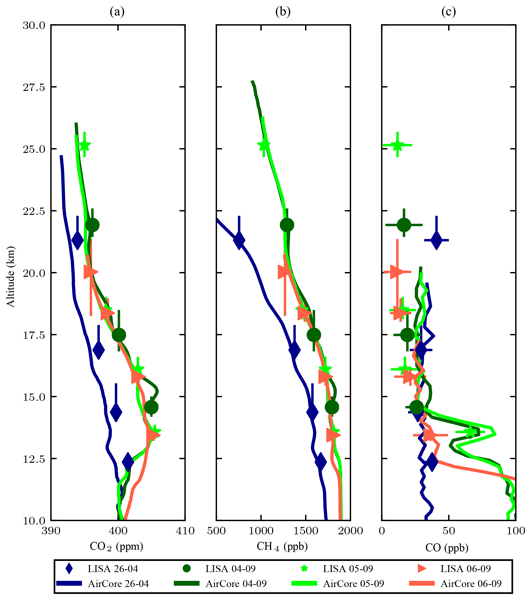 What was the source of the atmospheric CO2 increase during the Holocene? Mechanisms of atmospheric CO2 growth by 20 ppm from 6000 BCE to pre-industrial are still uncertain. We apply the Earth System model MPI-ESM-LR for two transient simulations of climate and carbon cycle. We show that an additional process, such as carbonate accumulation on shelves, is required for consistency with ice-core CO2 data. 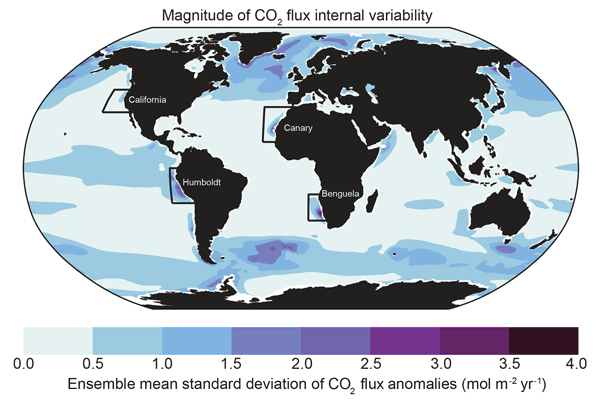 Our simulations support the hypothesis that the ocean was a source of CO2 until the late Holocene when anthropogenic CO2 sources started to affect atmospheric CO2. 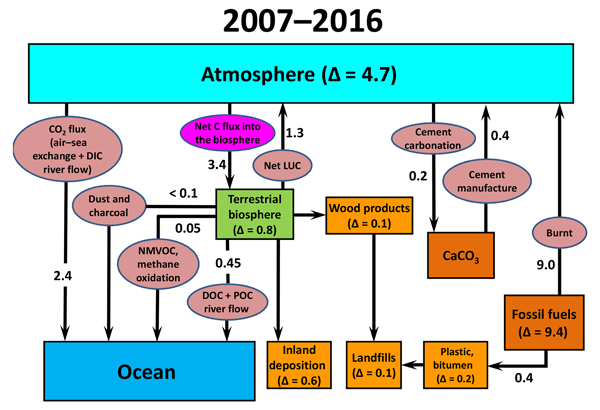 How much fossil fuel-derived carbon dioxide was taken up by land biosphere and ocean, respectively, was evaluated from atmospheric carbon dioxide and oxygen observations in the western Pacific over a 15-year period. The results showed that about 30 % and 18 % of the fossil fuel-derived carbon dioxide emitted during a 17-year period (2000–2016) were taken up by the ocean and land sinks, respectively. 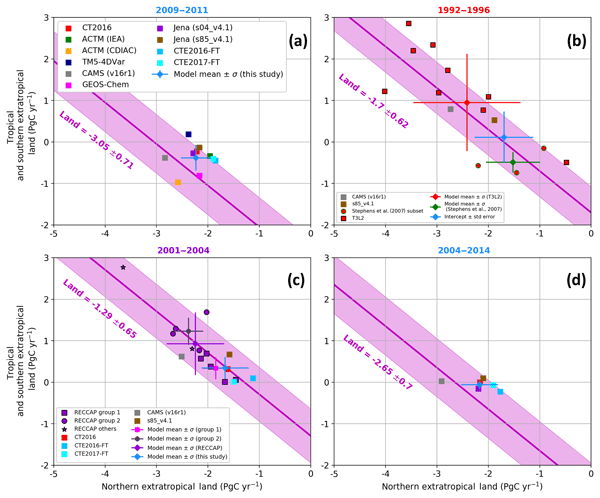 Long-term trends of land and ocean sinks for the decadal period were also evaluated. We introduced our identical systems, which were installed at three S. Korea stations, using CRDS and a drying system. 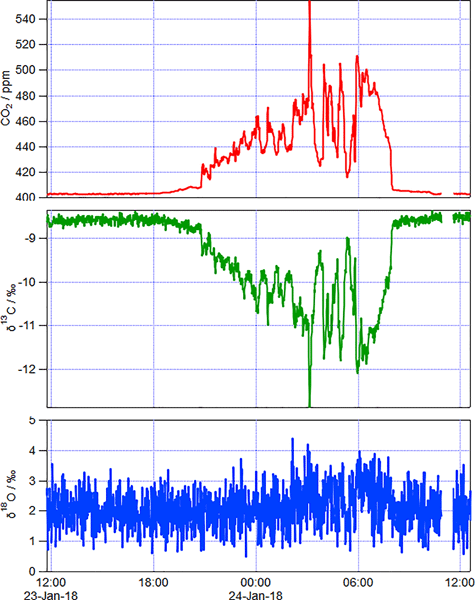 The measurement uncertainty was ~ 0.11 ppm across the stations. 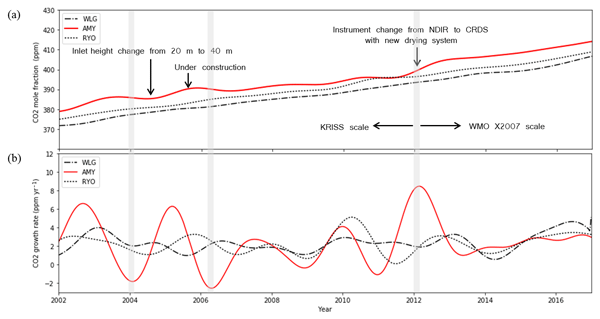 CO2 observed in the west of S. Korea was very sensitive to East Asia (e.g., China), indicating that data include CO2 flux information from East Asia. Through long-term comparison to other East Asian stations, it was suggested that they could be affected not only by local vegetation but also by measurement quality. The observed decrease of oxygen and warming in the ocean may adversely affect marine ecosystems and their services. We analyse results from an Earth System Model for the last millennium and the 21st century. We find changes in temperature and oxygen due to fossil fuel burning and other human activities to exceed natural variations in many ocean regions already today. Natural variability is biased low in earlier studies neglecting forcing from past volcanic eruptions and solar change. A long standing question in climate science is concerned with which processes contributed to the increase in atmospheric CO2 after the last ice age. From the range of possible processes we try to constrain the change in carbon storage in the land biosphere. 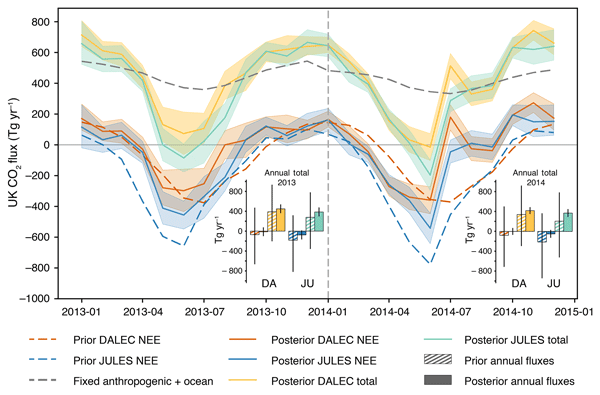 By combining ice-core and marine sediment data in a modeling framework we show that the carbon storage in the land biosphere increased largely after the last ice age. This will help to further understand processes at work in the Earth system. Predictions of global warming require predictions of how much CO2 will be taken up by the oceans, how much by land plants, and how much will stay in the atmosphere. Measurements of atmospheric oxygen (O2) help with these predictions if we also know the ratio of O2 release to CO2 uptake in land plants. We have measured this ratio in a mid-latitude forest and find a lower value than the one in wide use. 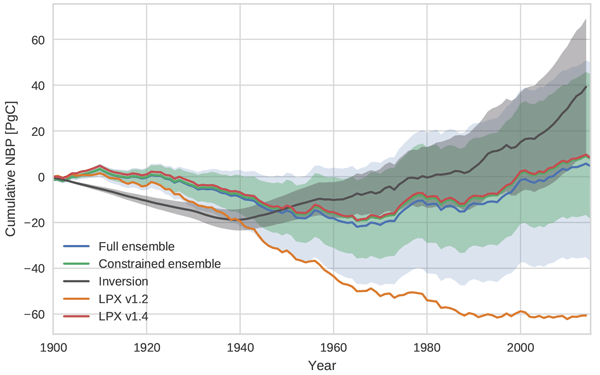 If correct, our results call for a modest adjustment in the global carbon budget. Satellite observations of atmospheric carbon dioxide offer extraordinary insights into the activity of terrestrial ecosystem activity on Earth. The algorithm we present provides researchers with a great deal more information from these satellite data than has been available in the past. 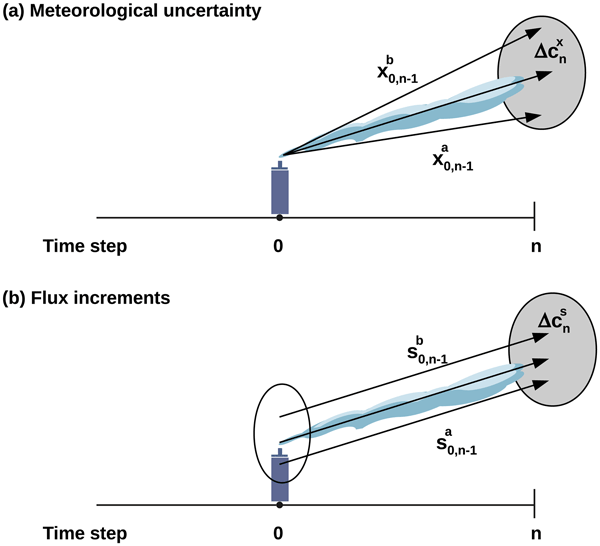 We hope the application of this algorithm and analysis tool provides insight into the atmospheric dynamics carbon dioxide and helps inform the development of global ecosystem models in the future. Nitrous oxide (N2O) is an important greenhouse gas and the major stratospheric ozone depleting substance, therefore, mitigation of anthropogenic N2O emissions is needed. To trace N2O emitting source processes, in this study, we observed N2O isotopocules above an intensively managed grassland research site with a recently developed laser spectroscopy method. Our results indicate that the domain of denitrification/nitrifier denitrification was the major N2O source. 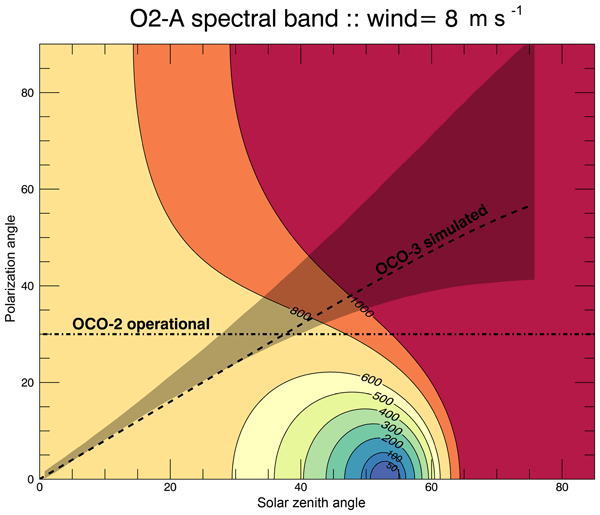 Observation of atmospheric O2 requires highly precise standard gas mixtures with uncertainty of less than 1 ppm for O2 mole fraction or 5 per meg for O2/N2. The uncertainty had not been achieved due unknown uncertainty factors in mass determination of the filled source gases. We first developed the primary standard mixtures with 1 ppm for O2 mole fraction or 5 per meg by identifying and reducing the unknown uncertainty factors.